If you’ve visited a farm market recently you’ve no doubt noticed that the sweet tender fruits of summer have been replaced with an array of sturdy greens and root vegetables. Glorious carrots and parsnips still damp with soil, beets in every golden and crimson shade imaginable, giant heads of cabbage, lush bunches of collards and chard, squash and gourds of every shape, size and color and of course one of my all time favorite root vegetables… turnips. Turnips are one of those vegetables people claim to either love or hate. They’ve gotten a considerable amount of bad press over the years but I’m here to say that if you think you hate turnips, it’s because you haven’t tried the right recipe. Luckily I happen to have a recipe that’s guaranteed to convert you. I won’t deny that turnips have a strong flavor, in fact the larger and older the turnip the stronger the flavor, but if you look for small young ones and balance out their inherent bitterness with some sweet onion and smokey bacon—you won’t believe you ever dared to slander the lovely turnip! In an effort to do right by this most maligned of vegetables, to make amends for the years of unfounded shunning and to give a boost to the turnip farmers of America… I offer you a challenge. I would love for each and every one of my readers to add this mashed turnip recipe to their Thanksgiving menu. (Unless of course you already have a killer recipe of your own and then— hi-fives all around!) Here’s how I see it… if we were all to serve one really amazing turnip recipe at this years holiday dinner we could be well on our way to having a nation full of turnip eating converts by days end. Imagine, “More candied sweet potatoes? No thanks. But pass the turnips please!” The very thought makes my head spin. So give this challenge of mine a bit of consideration and by all means let me know the results if you do undertake it. Think about it, not only will everyone consider you an amazing cook for making “turnips” delicious, you’ll also be making up for years of turnip snubbing. And seriously, don’t you owe turnips a little public relations payback anyway?!? I prefer yellow turnips over white and I like to buy a few small ones rather than one large one. Not only do the smaller ones tend to be sweeter, but they’re easier to handle as well. Peel and dice the turnips and add to a large pot of cold well salted water. Bring the turnips to a boil, uncover and allow to cook until the they’re extremely tender, about 30-40 minutes. While the turnips are cooking sauté the bacon it a large pan until it’s crisp and has rendered some of it’s fat. 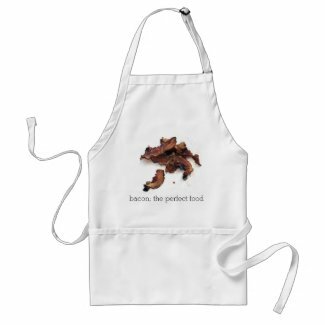 Remove the bacon with a slotted spoon and set aside. Add the diced onion to the pan and sauté until the onion is soft. (If your bacon is particularly lean and hasn’t rendered much fat add a bit of olive oil to the pan.) When softened add to the reserved bacon and set aside. Stir in the reserved bacon and onion, adjust seasonings and serve.